Are knives out for Ukip press officer who "f*cked up Croydon" and is now trying to taking credit for party gains? Ukip is now a 'proper political party' thanks to its successes in the Euro and local elections. And to prove it, there is already a spat brewing in the party's machine. 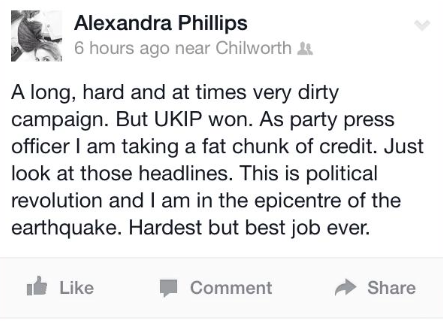 Press office Alexandra Phillips has irked many Ukip activists with a rather self-congratulatory Facebook update. Someone very close to the top said to me "It hasn't gone down well with the people who were victims of press stories or pounded the streets doing the canvassing!! She spent the last week in bed being *ill*, fucked up Croydon...and didn’t leaflet once."